Are We Seeing A Weather Pattern Shift? Colorado will see one more warm and summery day on Thursday before we start to change things for just a bit. 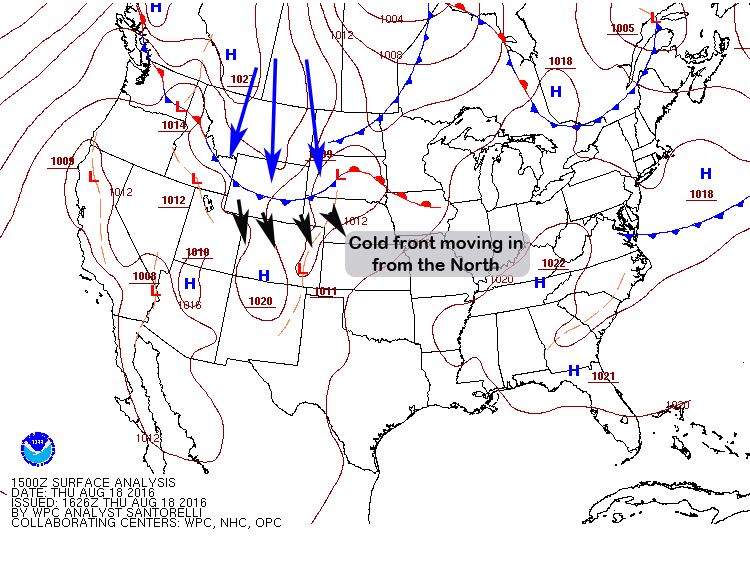 While this change isn’t going to stick around for a sustained period of time, it is riding in on a pretty strong cold front that will affect nearly the entire state of Colorado in one way or another. I’ll have more on the specifics of this change Friday morning and how it will impact our weekend, but there are some clues we are picking up on in the last few days that our summery, hot and dry pattern may be shifting just a bit. July was a very toasty month, this can be attributed to a stubborn high pressure ridge that kept warm desert air flowing into the state from the desert Southwest. While we did get a bit of monsoon rain, it never really established strongly for most areas along the Palmer Divide. 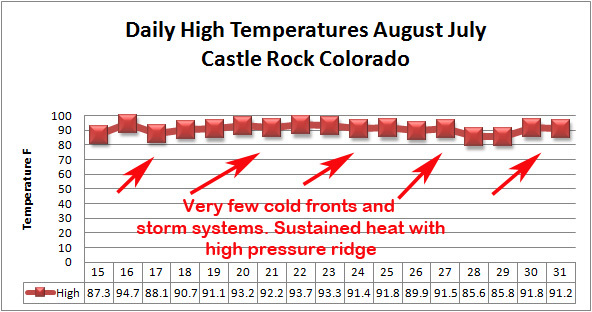 The high pressure ridge did however keep a lot of the stronger upper air low pressure systems away and kept their associated cold fronts from taking hold in Colorado. Most of July saw this very flat line for hot high temperatures. 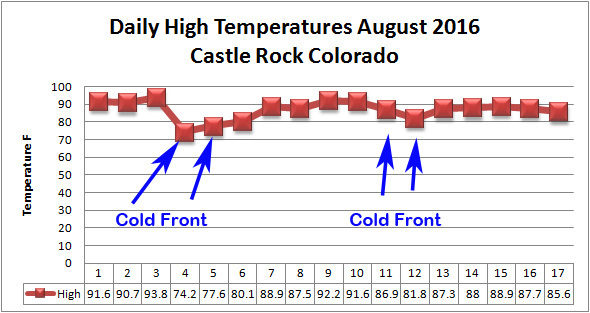 Notice that while daytime high temperatures have remained quite warm, we are starting to see cold pools of air take hold into Colorado better than they have the past month or two. This is synonymous with what we start to look for in Fall Weather patterns. It is still early yet, but the fact that we are starting to see these cool offs (brief as they may be) is encouraging! This weekend’s coming cold front will continue the pattern we have been seeing of these cool downs about every 7-10 days or so that started in August. 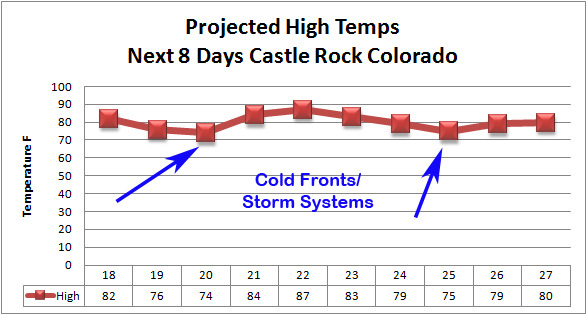 From today (Thursday) we can see two noticeable dips in the outlooks, similar to the dips from associated cold fronts. The cold front moving in late tonight will drop temperatures to mostly the low to mid 70’s in most areas South of Denver and along the Palmer Divide. We’ll have to keep an eye out to see if these trend warmer ( they did end up 5-7 degrees warmer than projected with last week’s cold front.) One thing to also notice is the overall temperature trend is lower than it has been the past few weeks, we don’t see any 90’s in this forecast! I’ll have an outlook Friday morning with what to expect with this cold front and the possibility of rain (some areas may see rain Thursday afternoon so keep that in mind.) Also, some mountain areas will see snow most likely on Friday night into Saturday morning!